Pictures, stories and recipes from our little piece of God's land! Farm Fare: Recipes from the farm! Meet the Dairy Goat Herd! Just a little introduction to our goats! More formal, current and "appropriate" photos will come soon to our website (which is being built as I type this.) But we are excited about breeding our goats and learning about and continuing the good breeding practices that have been started for us. Our goal is to breed for quality dairy and good health. Lost Valley's TM Via Dolorosa "Rose"
We just are in love with sweet Rose. But her sweet and easy going personality doesn't stop her from being the head of the other girls. Lost Valley's NKO Rachel's Well "Rachel"
Rachel definitely has a mind of her own, but can be reasoned with. LOL. She is a great hopeful for us as her momma has recently become a Sr. Grand Champion. Lost Valley's Sochi's Port "Sochi"
Sochi is the baby of the bunch and she's still trying to find her place in the herd. She would rather sit on our laps then hang out with the other goats and has such a cry that melts your heart. Lost Valley's CC Joseph's Dreams "Joey"
Sweet Joey, we used to say we should have called him lover boy. He still is a lover boy even though he's grown into his "manhood"! Lost Valley's TM Jericho's Wall "Jerry"
Jerry is the head of the herd, yet he's easy to work with and has a great personality. Lost Valley's Mai Best Chance "Chance"
Chance is our easy-going guy and is so very lovable. A good chicken stock is one of the most important things we try to keep in our fridge or freezer for quick, healthy soups or stews. Here is a basic soup recipe that can be used to make chicken noodle soup, chicken and dumplings or just about any soup that calls for chicken broth as the base. Enough water to cover the hen inside the pot. We use well water, but if you are on city water, consider using filtered water for your soup. Place hen or meat chicken into stock pot and cover with water. Turn up heat until close to boiling, then lower heat to a simmer. If you are using a stewing hen, it is best if the hen cooks very slowly at a low temperature, for at least 4-5 hours. I will usually set it on to cook over night, on simmer. Never boiling. Add 1 teaspoon salt and a few dashes of pepper. Cover and let simmer 5+ hours or overnight. When chicken is falling off of the bones, remove chicken from pot and remove meat from bones. Set aside. Add 3 T. of butter to a new stock pot and add the diced onions. Cook on medium heat until onions are translucent. Strain the broth through a metal strainer, into the onion butter mixture. I usually use only 1/2 to 3/4 of the broth made for soup and put the remaining broth into jars in the fridge for later use. Cook for 5-10 min until onions are soft. OPTIONAL: Take a hand or stick blender and blend the onions and broth in the pot. I like to do this because the blended onion makes a rich broth that looks more like a cream soup. AND I do this in order to hide many of the onions so more onion is eaten by the children in the home who don't prefer them. Onions are healthy and a part of a healthy soup. Add salt, pepper, turmeric, salt, pepper, celery and carrots. Cook 10-15 min. until vegetables are soft. Add chicken (which was removed from the bones previously) to the soup and cook until warmed through. And that's it! From here you can add dumplings, noodles, rice, potatoes or any other favorite soup recipe ingredients. Makes a healthy meal on it's own, or a great intro before the main course. If you are fortunate enough to have access to a farmer who raises pastured turkeys (organic pastured, even better) then you certainly don't want to waste even a little of it. We're always learning how to stay healthy while still stretching our food budget. This is one of the best ways right here! It's worth the extra cost to get a poultry raised on pasture and the cost isn't all that much more when you consider how many meals you can get from just the one turkey. Place the turkey carcass in the soup pot. Cover it as much as possible with water. I use water from our well, but if you are in the city, consider using filtered water. If the carcass is too big, you can try and break it up to make it fit. If you don’t have a pot big enough, buy one. You won’t regret it. Place the pot on the stovetop and turn the heat on high. Bring to a boil. Once it boils, skim the weird stuff off the top and turn the heat down. Add 1 T of the Apple Cider Vinegar. Let it cook. For many hours. I usually set mine up to cook after the holiday meal is over and I'm cleaning up. I then let it cook on simmer overnight. If you aren't cooking overnight, you will likely find that about three hours is usually enough. What you want to wait for is that moment when everything just collapses and the broth is golden and fragrant and has a nice glow to it. Turn off the heat and let the soup sit until cool enough to strain. But in the meantime, enjoy eating as much as you can. For the clearest broth, you will want to strain the liquid from the bones. I use a stainless steel fine mesh strainer that looks like a cone. Put it over another big pot, and pour the whole mixture in so the strainer still holds the bones and all that is in the other pot is a clear broth. Feel free to pick over the carcass and save the meat for use in other ways (all pets will stare adoringly at you while you complete this process). You now have “bone broth,” or basic soup stock. Ladle the broth into a wide-mouth glass jar (I use a funnel to reduce spillage). Make sure to leave an inch or two at the top of the jar because the broth will expand when it freezes. Put a label on it. Wait till it cools (store it in the fridge overnight if you must) and then put it in the freezer. This broth can then be used for soups, stews, chicken pot pie, or the base for just about any sauce. I even sneak it into my enchilada sauce as a base, in order to get the kids to eat more of this healthy broth. Our shell of a future storefront arrived yesterday and after about an hour of maneuvering, it is leveled and seated in its new home near the front of our property. This will be our hopeful new storefront where customers can stop by to get seasonal produce, canned goods, personal care products, eggs and eventually meat as well. It is only a "shell" currently so the work is only beginning. An additional window must be put in, electricity must be run, walls must be insulated and finished, lighting and many other details must be done this winter. Here are some photos of the efforts taken to get it into position and level. Livestock producers have been breeding for better cattle, sheep, hogs, and poultry for decades, yet the concept of raising an improved dairy goat eludes a lot of people. (Including us!) We are at the beginning of our big learning curve. Goats are fairly hardy animals but they are susceptible to several serious life-threatening health problems. Stomach worms, pneumonia, overeating disease, and coccidiosis are the most commonly seen diseases. Others include but are not limited to tetanus, listeriosis, polioencephalomacia, meningeal deerworm, caseous lymphadenitis, caprine arthritic encephalitis, Johnes disease, multiple pregnancy-related diseases, and several nutritionally-related illnesses and deficiencies. We are grateful to those much more experienced than us (with amazing results shown over 30+ years) for providing us a good start to our learning. A goat can look just a little “sick” or “down” one day, and the next day be gone. That is a heart-wrenching (and expensive) thought. Goats can go downhill so quickly that a “wait and see” approach is never a good idea. One thing we have learned is that the old saying, “An ounce of prevention is worth a pound of cure” rings very true with goats. So this post will focus on the “prevention” of illness or injury. Of course there are times when even when the best practices are followed, a goat owner may still have to deal with an illness. We’ll save that information for another post. This post is all about prevention. · Goats need to be able to roam with good forage/browse for them to eat. We currently have 5 pastures (adding two additional soon) on which to rotate our goats. During wormy season, we can rotate the goats more often to keep the bugs guessing and the population of parasites low. · We also rotate our goats with our chickens. Some vets have told us that coccidia parasites can transfer between goats and birds, but this is simply not true. Each parasite is species-specific! This is what we see in nature: birds always follow the herbivores around as they roam, and act as a bug-eating clean-up crew. They do not transfer parasites, they actually confuse them because a goat parasite cannot survive on a chicken and a chicken parasite cannot survive on a goat. · Goat fencing must be in good repair with openings that aren’t large enough to get their horns hooked. We use horse fencing for this purpose. · Clean water! Control where the goats are getting their water. No drinking from puddles or ponds. We clean out water buckets daily and keep them up off the ground as well. · Goats are browsers and really do not need, nor is it very good for them, to have grains. However, some grain mixes can assist with ensuring the goats get proper nutrition, vitamins and minerals. We give a small amount of only organic goat ration to our goats daily. Minerals available at all times, free choice. We use a goat mineral that is prepared specifically for goats, giving them the copper that is required along with the other critical minerals goats need. Hay is available free choice at all times. Hay is kept dry and free of mold. · Baking soda available at all times. If an upset stomach occurs, a goat knows just what to do. To make that extra acid in the stomachs calm down, they eat baking soda as needed. This is usually enough to keep the PH in the rumen at the right level. Protection from Predators… and Rain! · We are unable to have a guardian dog so we move our goats into the barn every night for sleeping. · Keep them dry! This is important. Goat’s hate being wet and there is a reason for that. A dry goat is less likely to develop illness and parasites. o This is another reason we always have the barn stalls ready. In the case of heavy rain or muddy pastures, they have a dry place to be. o Parasites love wet, warm pastures, so when it rains we rotate the goats more often before the parasite load has a chance to build to a dangerous level. o In addition, the dry resting places (in our case, barn stalls) keep their hooves from developing rot from too much wetness. o We provide a wooden stand that the goats can get up on if they want to get off a pasture covered with dew. That table gives them a dry place to stand or rest. 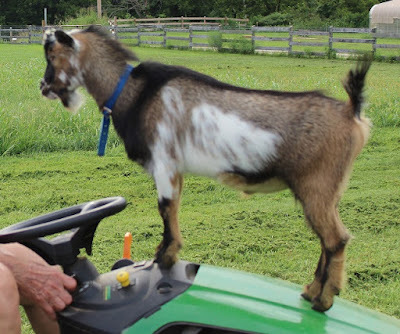 Plus, goats just generally like to climb on things! · Properly trimming hooves regularly will help with preventing both foot rot and potential lameness from overgrown hooves. The ability and willingness to check on goats on a daily basis. Yes daily! Checking for hydration, checking their poo and their general look for any sign of illness. Watching for diarrhea (also called ‘scours’ in goats) is important because it many times can indicate an underlying illness. Taking their temperature and watching for changes is critical if scours are present. Checking the inside of a goats eyelids tells us about their health as well. They should have a very pink/red lid. Goats can go into dehydration quickly when they have scours, which can quickly lead to too much acid in the stomach. Once a goat is lying down, tail down, ears down, and/or not eating… it’s many times too late. Attentiveness can save a goat. It sometimes means dropping everything else we have going on that day to administer proper next steps. But an ounce of prevention is well worth it! You Can Use Those Green Tomatoes! And so as we learn this, we try to look for new ways to be thrifty. We learned a new way to be thrifty just recently from an elderly woman we met who was raised on a farm near the end of the depression. She told us that we could be using all our green tomatoes for things other than relish or fried green tomatoes. We were so happy to hear this! This year, when the cold nights started, we knew we would not be getting many (or possibly any) red tomatoes. Yet, we had SO many green tomatoes on the vine. So we picked around 100 lbs of these green tomatoes and sorted them and used this woman’s idea – and so far it is working! Simply take the green tomatoes that look well-formed and without any bugs or cracks in them, and wrap them in paper (newspaper works fine, but we used packing paper.) Place them in the basement storage and then weekly, assign someone to go down and turn them, and check them, seeing if any are ripe. Sure enough, we have found several that have ripened just perfectly in just a week. Those that aren’t ripe are re-wrapped and put back into the basement storage. Once we have enough that are ripe, or too many that are ripe for us to eat, we can blanch them and can them for the winter stews and sauces. What a blessing this new idea was for us. We hope you can try it as well! This was a long awaited event... Dylan started raising bees with his dad about 3 years ago. He invested his own money in some of the hives and equipment. And the first two years had many ups and downs. Even the most seasoned bee keepers have hives that die, or swarm and are lost. It's an expensive business to be in, and the bees don't always cooperate. So today, the boys went out and took two frames from each of the remaining hives and extracted their first batch of honey! It was a crowd gathering event because we've waited so long to have our own honey, and because we've never done this before so there is always an interesting learning curve. Finally, it's all set up and ready to go! They pulled just two frames from each hive so they could be sure to leave enough honey for the bees to overwinter. It's a fine art as I understand it - you must leave enough honey for the bees to overwinter, but NOT too much because with too much honey they will not get rid of any bees over the winter and end up so crowded that you'll get half the hive leaving in a swarm the following spring. Leaving you to wait for a new queen to be raised up. First a hot knife is used to get the "caps" off of the honey. The goal is to take off the caps but leave the honey comb in place so the bees can reuse it. Then the frames are put into the honey extractor and the handle on top is used to gently spin them around, releasing the honey to fall to the bottom. And finally, honey came pouring out. I was amazed that they had over a gallon of honey from just 4 frames! And so thrilled for Dylan who has put so much time and money into this. He will now get to sell his first batch of honey. And we all get to enjoy our own honey this winter! Endurance (vs. Giving-Up) - The inward strength to withstand stress to accomplish God's best.